Vision: Student success IS Patrick Henry Community College. Mission: PHCC is a comprehensive community college committed to enriching the quality of life in its service region through academic excellence, student success, workforce development, community engagement, and lifelong learning. Teaching and learning are paramount at PHCC and simply the heart of everything we do. Our people are our most valuable asset. To promote a culture of integrity and respect for students and employees, PHCC develops, nurtures, and sustains an engaged, diverse, and talented workforce. We effectively communicate and collaborate with both internal and external stakeholders. Furthermore, we seek to foster relationships and build partnerships that enhance the success and quality of life of all constituents. History: Patrick Henry Community College is one of 23 community colleges in Virginia and was founded in 1962 as a two-year branch of the University of Virginia's School of General Studies. PHCC became an autonomous two-year college of the university two years later. The college enrolled its first students in the old Northside Elementary School in Martinsville and moved to its present campus in the fall of 1969 with the completion of the administration building. The Learning Resource Center (LRC) was completed in the spring of 1971, and the college became part of the Virginia Community College System on July 1, 1971. Serving Martinsville, Henry County, and Patrick County, PHCC is a comprehensive open-door institution, accredited by the Southern Association of Colleges and Schools Commission on Colleges (SACSCOC) to award associate degrees. Patrick Henry offers many associate degree programs, certificate programs, and career studies programs, which include a variety of nontraditional programs such as industry-recognized certifications, developmental and transitional programs, and personal enrichment courses. The top three degree programs: General Studies, Science, and Health Sciences. PHCC has students from a variety of countries including Australia, Brazil, Germany, Ecuador, Finland, France, Great Britain, Kuwait, New Zealand, and Sweden, as well as Puerto Rico. Student ages range from 15 to 95. Students in the fall 2016 include: 59% female, 41% male; 50% full-time, 50% part-time; 29% minority. 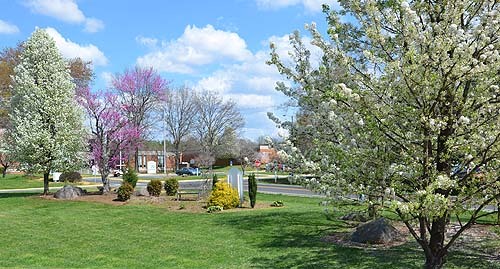 Situated on 137 acres, Patrick Henry Community College is located approximately three miles north of Martinsville. The college has several off-campus sites consisting of workforce development centers in Stuart and Martinsville, the IDEA Center in Uptown Martinsville, and the Virginia Motorsports Training Center at Arrington Manufacturing in Henry County. PHCC offers National Junior College Athletic Association (NJCAA)-sanctioned teams for men (baseball, basketball, cross country, golf, soccer) and women (basketball, cross country, golf, softball, soccer, volleyball). The Patriots also has a cheerleading and bass fishing team. Fitness and weight rooms are open to all PHCC students. Outside the classroom, PHCC students participate in clubs and organizations, theater productions, art exhibits, student activities, and the Student Government Association. Students may take advantage of free tutoring sessions, various off-campus trips, and cultural events.